Those of you who know me in real life may know that I've been participating in a program offered by my local yoga studio, Breathe Yoga called 'Reclaim Your Diet'. In brief it is an introduction/refresher to the idea that we've lost our connection with the food we eat, ala Michael Pollan, etc. ; based on the movie and book Hungry For Change. I've always eaten pretty healthy, although there are things that we can all do to eat *healthier*. I have especially always enjoyed cooking, although between theatre productions and the holidays I got very far removed from that love and process. Finding that drive, motivation and inspiration has been great. 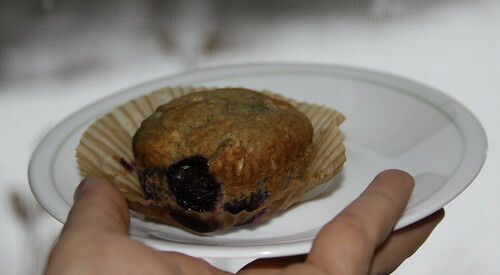 So, fast forward to almost being finished with the program and really wanting to make these Blueberry Coconut Muffins. Reading the recipe, I was aghast, 2 eggs, 1/2 c. heavy cream, 1 stick butter?! Seriously, even if those were all organic, that is pretty heavy! So, I consciously made out to make them vegan and see what all these nutrition classes have taught me. I also wanted to switch out the sugar, but there wasn't many dry ingredients left after I made the other changes, so, maybe next time. Preheat oven to 350o and line muffin pans with liners. Beat sugar and coconut oil on low speed until combined. Add banana and beat that at low speed until really integrated and you see few chunks in the batter. Add coconut milk and vanilla. In a separate bowl, combine flours, salt, cinnamon, baking powder, baking soda. Add dry ingredients to wet, mixing at a low speed. At this point batter will be well-combined but stretchy. This is okay. Fold in blueberries and coconut flakes. Drop by heaping spoonful into lined muffin tin. Bake at middle rack of oven for 20 minutes. Makes approximately 14-18 muffins. January was an easy month for me as I wanted to get a couple of projects that have been sitting around out of the way. First up, Alex's blanket. It was fleece and easy, I just had to *make* the time to get it done. That's what these projects are all about, making the time to finish some things. 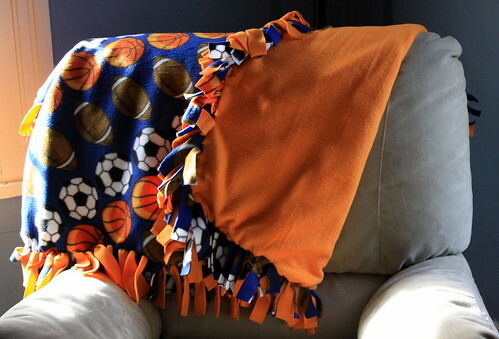 And since I was sending something to Alex, I couldn't neglect his older brother, Ben, who I had already made a blanket a couple of years ago. For the older, some more mature, Star Wars pillowcases. I also have a couple of bonus finishes, but those will come in a separate post. Onto February! 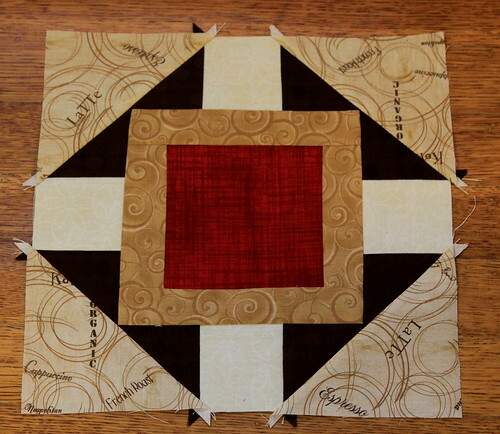 Due to my massive success in my 12 for 2012 goals, I've moved on to 2013, finally picking my projects. There are more than 13 here, but the goal is to complete at least 13 of them. I learned from last year, so hopefully my months are better structured. I've added Birthday Blocks as bonuses as I can really churn those out in a weekend and really tried to list the "main" project first, those things I've been putting off forever. First of all, I cannot express how accomplished I feel. Although I didn't get every thing on my list completed, in some ways, I got so much more done - so many bonus projects finished on top of the 12 for 2012. 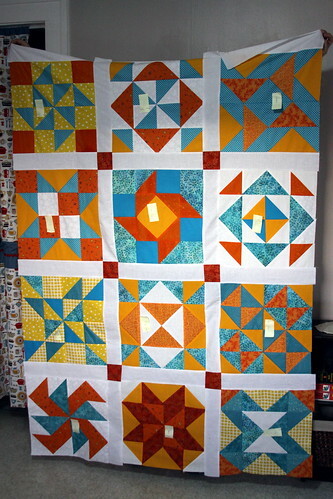 Two projects from 2012 will cross over to 2013, and only one of those because it was a late finish and I'll have to sew a binding. Overall, I'm really happy. In case you don't want to slog through all the details and the long picture-heavy post, here's a slideshow! My bonus projects are in the slideshow below, but not discussed in detail after the show - so enjoy! So, now the lengthy post with words and pictures. Summarized from previous posts for the most part, so you won't find anything terribly new here. 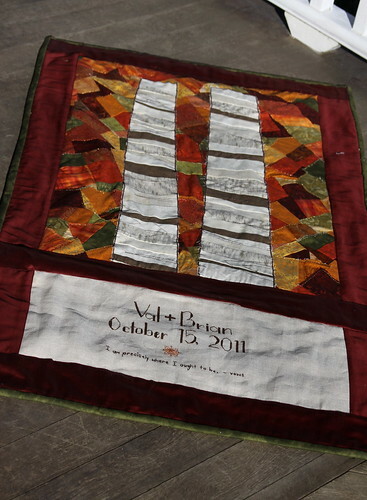 This was the wedding present for my friend Val and her husband, Brian. I was lucky enough to participate in their October of 2011 wedding and had this finished in time for their return from their honeymoon. 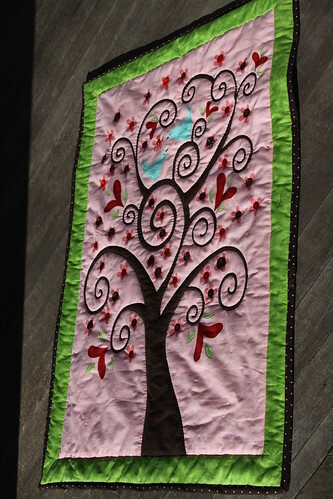 First up in February was this wall-hanging that I had started the summer of 2011. All it needed was to have the buttons sewn on and to have the binding done, so for February, it became a finished project. Many of the buttons were antique inherited buttons, so this is one of my sentimental favorites from this year. Although some may consider it cheating, I don't! 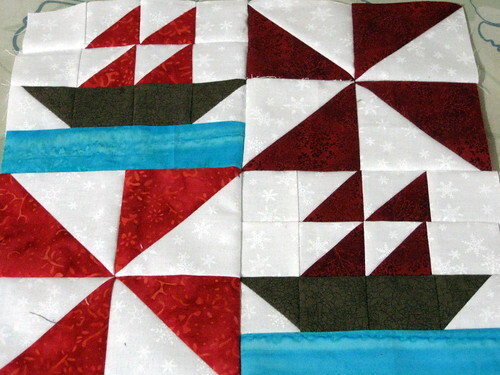 This was a block for a quilting swap that I moderate over on LiveJournal. 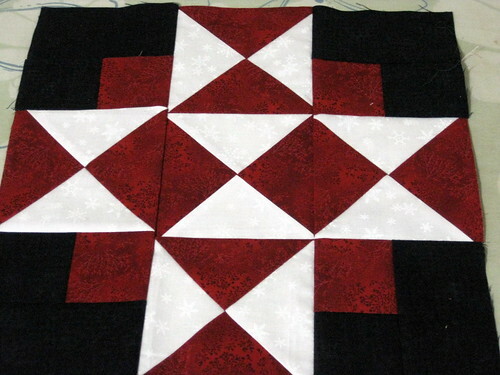 This was Cari's block and she asked for a red, white and black block. I finished this top. Then I began to promptly hate it. (You can read all about my struggle with this piece and myself here.) Needless to say, I finally brought it to my "Finish That Damn Project" sewing day at my LFS and donated it to members of a local guild to finish off and donate to whatever project they find fits. I'm glad it will do some good in the world....far away from me! 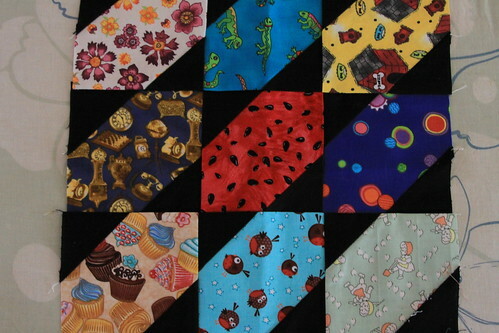 2012's Birthday Blocks. 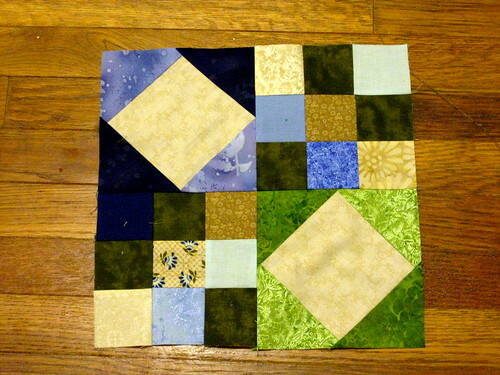 This quilt will receive its own post hopefully sometime in February when it is gifted. 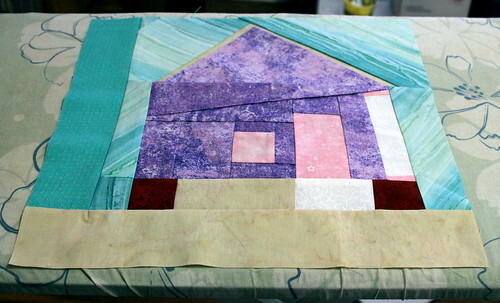 I will tell you that it is now quilted, backed, bound and labeled and ready to be given to the recipients. There's no picture for this one. It was to cut t-shirts for a late t-shirt quilt. I went to get out the shirts and they were already cut! Go me for being productive! 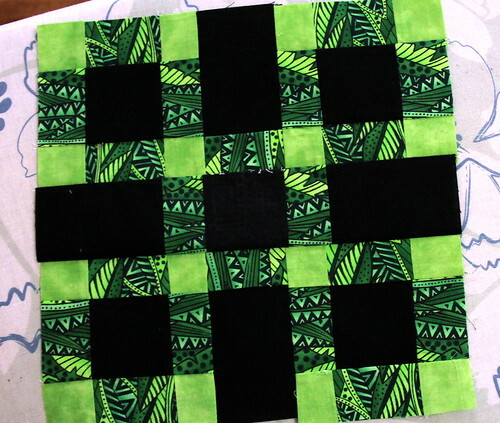 Two more birthday blocks. Julie's and Cat's. Bringing the Birthday Blocks to a close. 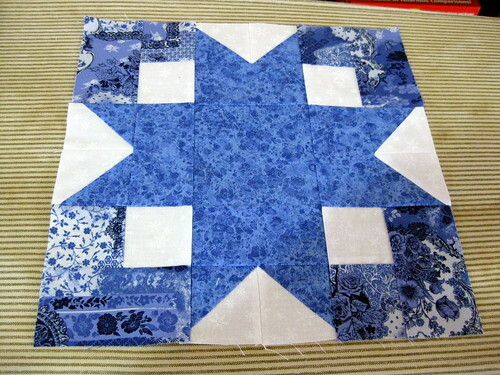 Also not a picture of this one as it will be a carry-over project, to finish my 2010 Birthday Blocks quilt. 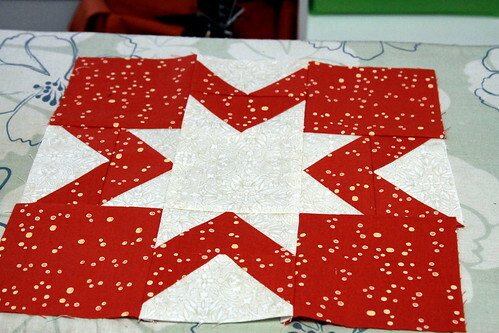 The top and back are now done and waiting for the long-armer, so this will be a 2013 finish for sure. 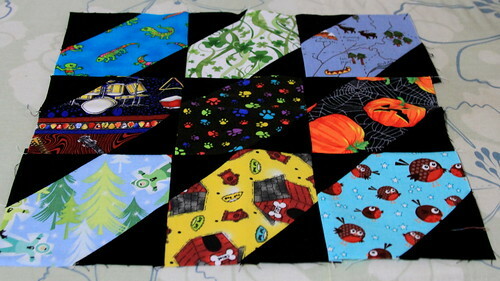 So, the goal was to finish the t-shirt quilt, but I didn't. I didn't even get it laid out. 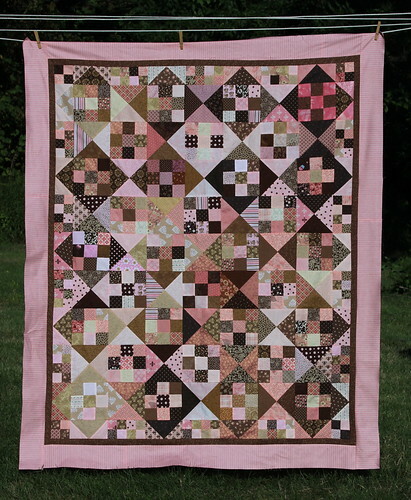 What I did do though was finish 4 more quilts so that they could head to the long-armer, so they are in a pile waiting for her. So, I think that is as good as an excuse as any as to why I didn't get it done in 2012. Now....time to consider 2013! Who's in? I have 9 projects already on my list. 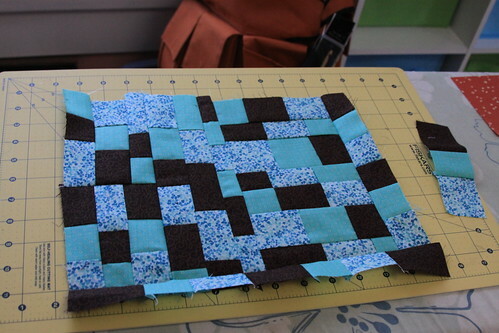 I think I can fill in the rest with Birthday Blocks, right?